This article got me thinking: How Spanish am I?? Sure, I’m not Spanish by birth, but I’ve lived in southern Spain for 12 years – a short time compared with Lisa and her family who have just celebrated their 25th anniversary as expats – so I thought it would be interesting to take a look at some of the points in the article which measure the Spanish way of life against the ways of its European cousins, and check to see how my own life in Spain holds up. You’ll notice immediately how the Spaniards do everything later. And check out their working hours. There’s a ‘grey’ area around breakfast time, when some workers start earlier than others, but a late finish is guaranteed. Finishing late means a late dinner time, and a late dinner time means a late bedtime. No problem with that, perhaps. 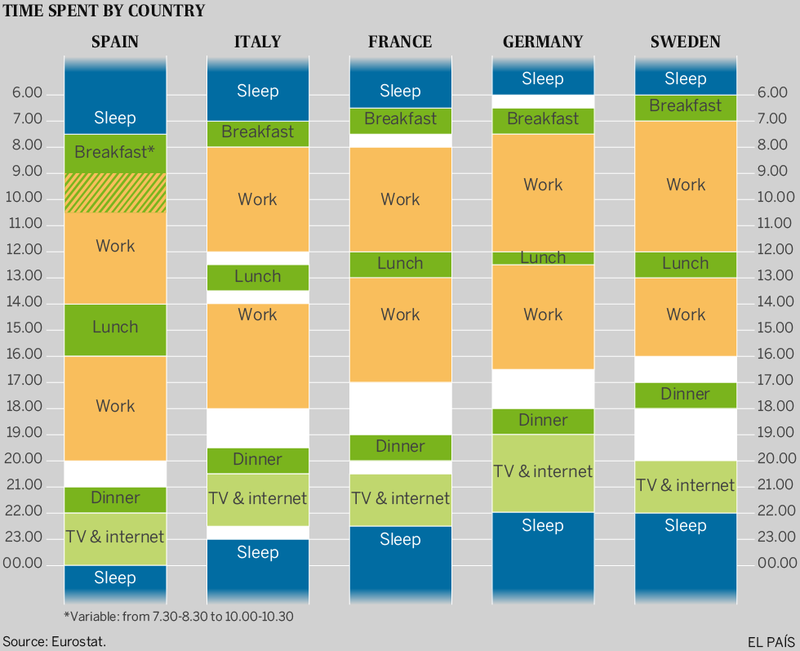 But as you can see, Spaniards wake up at roughly the same time as their European counterparts, and that means they must be tired in the mornings – they don’t get enough sleep! Now, what of my typical day in Spain? I usually get up between 8am and 9am – a bit later than my Spanish friends. I work until 12.30 when I break for lunch. Early!! I almost always have a siesta – not a luxury afforded to many these days – then return to work at around 3pm. Dinner is normally at about 8.30pm – close to the Spanish average, and a full 8 hours after lunch – and I fall asleep at close to midnight. So, that makes me relatively Spanish doesn’t it! Lisa, how’s your working day structured? And how Spanish do you consider yourself to be after 25 years of living here?